Creative Labs | IT Xpress Fixed It! In servicing a variety of Dell laptops and desktops – I’ve found more than once that the driver page for a given model does not contain the Webcam driver and associated Webcam Central software (from Creative). I don’t know if this is a licensing thing with Creative or just oversight. But I wasn’t repairing a monitor – this was an All-In-One (but often was also a laptop). I finally got tired of looking and not wanting to install something that would make things worse (since not ALL Dell webcam enabled computers use the same software), I initiated an online chat with Dell. Instead of just sending me a link, the agent started up a slick repair utility she uploaded called Click 2 Fix +. After doing an ‘Uninstall’ for the Integrated Webcam and restart, she used the Webcam Repair tool in C2F. It ran through the paces and, sure enough, downloaded??? The SX2210WFP Monitor Webcam Package. It ran the installer (which updated Webcam Central and also kicked off a Creative Labs update check.) and voila! The camera worked again. Oddly – the driver (this was Windows 8.1 x64) is still the built in Microsoft driver that was there before. So I guess the issue was in the other software or it just needed a reinstall. 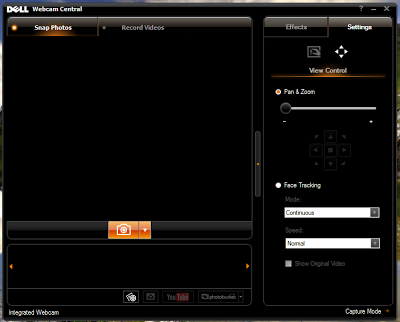 But now I know how to update/reinstall the Webcam Central stuff! Again – not all Dell’s use the same Webcam software – but if yours uses the version from Creative Labs… This might do the trick if you can’t find the install package.